The Villa Park Public Library is a vital part of the community. Our building is located at 305 S. Ardmore, near the heart of Villa Park. We offer physical materials and electronic materials, as well as public computers with internet access, printers, and copiers. Library cards are available for free to Villa Park residents. The Library also provides many additional services. Our dedicated staff work hard to follow the mission and vision of the library, increase the quality and circulation of materials, and provide all our patrons with excellent resources. Check out the latest news, look for jobs at the library, or learn more about our history. The library is governed by a Board of Trustees. The Board determines library policies. 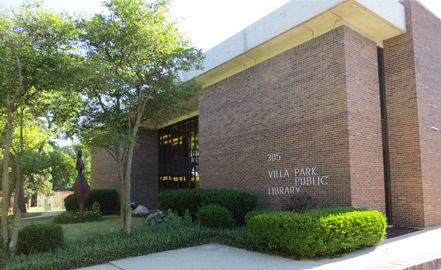 The Villa Park Public Library builds, connects, and partners with our community to encourage exploration and discovery. The Library nurtures this growth through education, literacy, technology, and fun. The Library will provide and promote a diverse assortment of cultural, educational, and recreational services to a continually changing community. The Library will have a facility to accommodate these services as well as expanding collections and evolving technologies. The Library will provide well-compensated, educated, and motivated staff members who aspire to the highest level of customer service and ethical standards. To fulfill the Library’s mission, the Library will also develop strong relationships with community volunteers and organizations.